Lymphoma is a blood cancer affecting white blood cells and develops in the lymphatic system. Lymphoma is a general term for cancer of the lymphatic system. The lymphatic system is part of the body’s immune system which protects against disease/infection and it is a network of vessels that run throughout the body, similar to blood vessels. These vessels carry colourless liquid called lymph, which circulates nutrients, waste and white blood cells around the body. Lymphoma arises when developing lymphocytes (a type of white blood cell) undergo a malignant (cancerous) change and multiply in an uncontrolled way. The big problem is that these cells start to divide before they are fully mature. This means they can’t fight infection as normal white blood cells do. Another problem is that the abnormal lymphocytes start to collect in the lymph nodes (located in all parts of the body, but most easily found in the neck, armpit and groin) or in other parts of the body such as the bone marrow, spleen or other organs. These collections of lymphoma cells can grow into tumours and begin to cause problems within the lymphatic system or the organ in which they are growing. For example, if a lymphoma starts in the thyroid gland it can affect the normal production of thyroid hormones. Over time, lymphoma cells replace normal lymphocytes, weakening the immune system’s ability to fight infection. 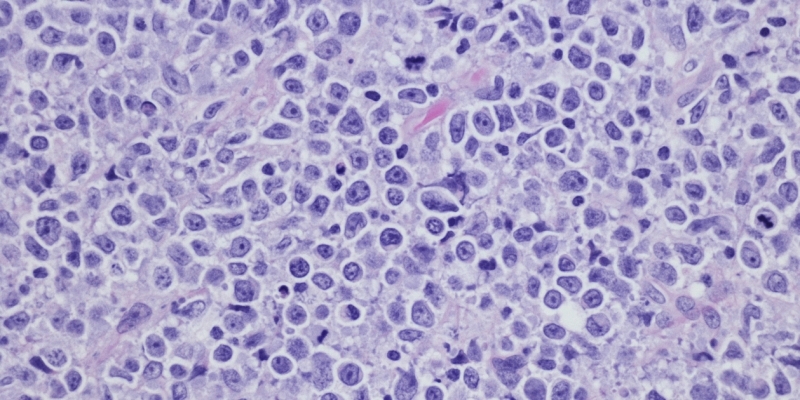 There are many different sub-types of lymphoma, which are divided into two main types. The two types of lymphoma spread differently and are treated differently. This is a rare form of lymphoma characterised by a particular abnormal tumour cell – Reed Sternberg – not present in other forms of lymphoma. Any lymphoma that is not Hodgkin lymphoma is classified as non-Hodgkin lymphoma. There are more than 30 different subtypes of non-Hodgkin lymphoma, which are generally classified into two equal groups, depending on the rate at which the tumour is growing. Indolent (low-grade): Tumour cells divide and multiply slowly making initial diagnosis difficult. Patients may live many years with the disease, yet standard treatment cannot cure the disease in its advanced stages. Aggressive (intermediate/high grade): Tumour cells divide and multiply rapidly in the body and, if left untreated, can be fatal within four weeks to two years. Unlike indolent NHL, treatment of aggressive NHL can lead to patients being cured.